The latest version of the InPixio Photo Clip 8 software enables distracting objects and people to be cropped and erased from existing photos in just a few clicks. In addition to batch processing, photo management and text integration, the user-friendly program also boasts some great new features for semi-professionals and amateur photographers. Photo enthusiasts often wish there were digital scissors and that unwanted people, unsightly backgrounds or inappropriate objects could be removed without affecting the quality of the image or leaving behind a gaping hole. This is where InPixio Photo Clip 8 Professional comes into its own, the perfect affordable and user-friendly solution for anyone wanting to enhance their images quickly and easily. 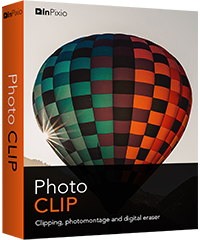 The photo software includes a versatile digital cutting tool, which can be used to crop out any details, people, objects, or even entire scenes, in photos and erase distracting elements. Thus, unwanted objects can be erased and backgrounds replaced easily, and effects or filters can be applied to memories to create digital photomontages in no time at all. 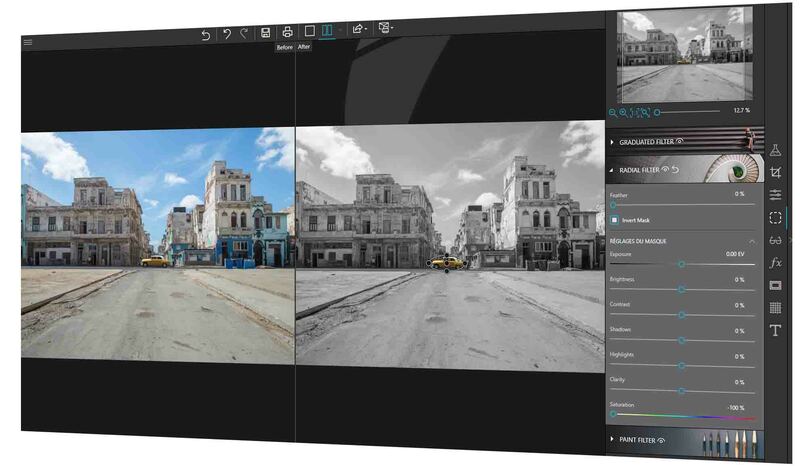 In the Professional Version 8, InPixio Photo Clip offers a number of new features that even amateur photographers can use to remove distracting elements, backgrounds and people from their images very easily. In addition to brand new features, such as various filters and haze and noise reduction, there are new backgrounds for photomontages, a comprehensive user guide, detailed explanations and practical tips on how to use the product. As in the previous version, thanks to batch processing, any number of images can also be edited at once and text can be incorporated into the photographic works in InPixio Photo Clip 8. Unwanted objects, e.g. signs, cables, unknown or unwanted people, or other elements that draw the eye away from the subject, can thus be erased very easily. With the automatic color recognition function, image elements against a single-color background can easily be erased with only one click. InPixio Photo Clip 8 also makes photo library management and organization incredibly simple. The newly created images can of course be saved and easily uploaded to social networks such as Facebook, Flickr and Picasa, etc. With InPixio Photo Clip 8, there is no longer any need to worry about capturing that perfect picture in a crowded tourist spot on holiday. Just take a photo and erase all the distracting elements. Cutting out image objects carefully takes a lot of time and concentration. This stress can now be saved. Other image processing programs require a lot of training or the editing is clearly visible. This is not the case with InPixio Photo Clip 8. The technical features mean the areas of the image that need filling after the erasing are detected automatically so that the new photo looks natural and no traces of editing are visible. New editing tools, such as the “selective retouching module”, provide graduated and radial filters and touch-up brushes. The sharpness module brings clarity to the photos, while the film grain module gives images an artistic or nostalgic effect by adding grain. And the new module for creative blur is a brand new way of fully or partially blurring photos – a very cool effect! In addition, new templates for filters, frames and textures enable users to apply professional effects to their photos. Photos, cards and other personalized printed items can then be ordered via the user interface from an online print service with just a few clicks. Thousands of templates are provided for these. The ordered prints are delivered within 5 days guaranteed – worldwide! Backgrounds for photomontages: 25 new backgrounds available: fun, science fiction, sport, festive, etc. Noise reduction (Professional version only): Used to effectively reduce noise in photos taken in poor light. Haze reduction (Professional version only): This touch-up tool for (atmospheric) haze limits or eliminates even unwanted haze effects on photos. Sort photos and film: All photos in the folder currently displayed can be shown by name, date or size in ascending or descending order. Improved, easier to use interface: The new version has been given a sophisticated user interface. The graphical elements have been redesigned with an artistic touch. Dynamic user interface for Windows 10: The user interface is automatically adapted to the user’s selection. Online print service: Order the following in just a few clicks via the user interface: photos, cards and other personalized items – thousands of templates available. Printed and delivered within 5 days guaranteed – worldwide! Creative blur module: A brand new module to fully or partially blur your photos. Function to “Share” to Facebook, Twitter, Flickr, etc. InPixio Photo Clip 8 is available from early March 2018 and costs (RRP incl. VAT): $49.99 (Standard version) and $79.99 (Professional version).